When we create a new tab in the browser, a new browsing context is created. A browsing context aggregates a lot of different things that we take for granted: things like session and history management, navigation and resource loading. We also have an event loop, which is used to process the interaction between scripts and the DOM. In this tutorial we will first get an essential understanding of the event loop, which is mostly designed following the reactor pattern. Then we look at some auxiliary objects that are associated with the browsing context. Finally we will work out a list of best practices to utilize the event loop as efficiently as possible. 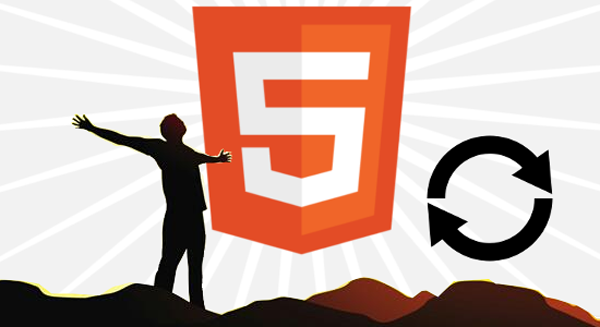 Each browsing context comes with an associated event loop. The event loop is bound to the window of the context’s current document. It can be shared with another window that hosts a document from the same origin. A demultiplexer to normalize running the events. A dispatcher, which registers / unregisters handlers and dispatches events. Of course we also need event handlers to use the resources referenced with the handles. The demultiplexer sends the handle to the dispatcher as soon as possible, i.e. after all previous events have been handled. Internally the demultiplexer may have some kind of queue, which operates using the first-in-first-out (FIFO) principle. Real implementations may use some kind of priority queue. The following diagram sketches the relation between the different components of the reactor pattern. There are multiple dispatchers, since, for example, every EventTarget is able to register, unregister and dispatch events. There is, however, only one assigned demultiplexer per event loop. To illustrate this concept, let’s consider the following piece of code. If we now save the call-stack after each change, we end up with the following picture. We start with an empty call-stack. After calling the init function we have an element on the stack. The setTimeout call gives us another element, even though the function itself will only make the context switch to a native function. Having returned to the init method we are left with a single element on the stack. Finally the stack is empty again. We’ll see that foo, baz and bar will be logged. Therefore the focus event was processed right after calling focus(). There are also events, such as the DOM mutation events, which are always triggered synchronously. We discuss DOM mutation events in the eighth article of this series. 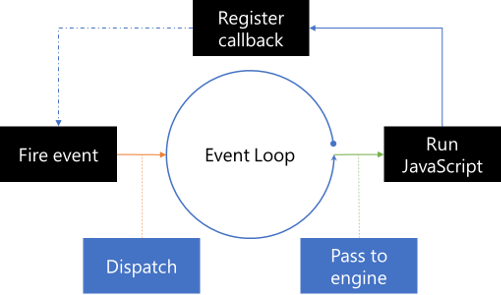 The event demultiplexer implementation for the event loop in a browser has to distinguish between running ordinary event callbacks (known as Tasks) and preferred smaller chunks of code, which are named Microtasks. While tasks are enqueued in the normal way, microtasks are enqueued with high priority. They are executed as soon as possible, i.e. always before the next task. Most DOM interactions are enqueued to the event loop as tasks, e.g. calling the callback function of setTimeout. On the other hand, the callbacks of the new Promise type are invoked as microtasks. Another example for an API that enqueues microtasks is the MutationObserver interface. For the moment we postpone the discussion of the MutationObserver to the eighth article of this series. The following example illustrates the difference between an ordinary task and a microtask. We’ll see that foo, qux, bar, norf and baz are logged. The order of norf and baz could be wrong depending on the browser, but should be as presented. Running the previous sample code in the browser’s console also yields an interesting result. As an example, the outcome for the latest version of Opera is displayed below. The result of the init function (undefined) is displayed after the callback from the Promise has been executed. Therefore the debugger tools of the browser are integrated using a normal task—not a microtask. While the browser may use the time between normal tasks to perform intrinsic steps, such as issuing a render call, microtasks will be run immediately after running the current code has been finished. A browsing context contains many more services. Most of these services are usually not accessible, but some of them may expose an API that we can use. For instance, some hardware-based services are exposed in the navigator object. The state of the entry to push. This has to be a string. We could use a JSON data structure. A title for our reference. This is not used by most browsers, hence we can omit this parameter altogether. Finally a URL to display. Browsers will usually show it in the location bar. Calling pushState will immediately change the displayed URL. What happens when the user presses the omnipresent back button? Generally speaking it is up to the browser to decide, but a good decision would be to pop the current state. Invoking back programmatically or via the UI may lead to going back to the previous page. If the stack is already empty we cannot pop the current state. This can also be experienced with a short demo, which involves two buttons and a list. The example code to trigger the logic looks as follows. The history API is a nice way to implement routing in a single-page application (SPA). An alternative way that still uses the URL for routing is given by manipulating the URL’s hash and listening to the hashchange event. Again we use events to trigger callbacks asynchronously. A drawback of the event loop is that a web application depends highly on the processing time of the currently active task or microtask. We are therefore not able to enqueue a long-running computation. The browser would stop the computation after some time. A good practice to circumvent this is to split the computation into several parts, which are processed by the event loop one after another. In browsers, callbacks are enqueued any time the associated event occurs. Events without a callback won’t enqueue anything. Calling setTimeout() waits at least the provided time before enqueuing the specified callback in the queue. If there is no other task in the queue, the callback will be invoked right away, otherwise we have to wait. This is the reason why the second argument of setTimeout defines a minimum time and not a guaranteed time. Long-running computations should be placed in a Worker, which provides its own event loop. It also contains its own memory management. Therefore a web worker will not interfere with the event loop of our web application, since communication is done via events. The whole scheme is non-blocking. In general we should always try to avoid using blocking code. Most of the API is already exposed in a non-blocking fashion, either using callbacks directly or events. Unfortunately, there are legacy exceptions, such as alert or synchronous XHR. They should never be used unless we know exactly what we are doing. So should we use a task or a microtask? The Promise API uses a microtask for a reason. If available we may want to aim for that. The microtask is performed as soon as possible, practically following directly after the current code is executed. It could therefore prevent unnecessary rendering. Why should we render once before inserting a result, which will result in requiring another render operation? However, if in doubt we should pass the control back to the browser by using a standard task. In the previous tutorial we saw that the browser supplies us with several mechanisms that are aggregated in the browsing context and exposed at several points. Even though we cannot control some of the internal mechanisms, we still should know that they exist and how they work. Hello! I recently would like to provide a large thumbs up for your good info you have here on this article. I'll be returning toyour website for more soon. I enjoy what you guys are usually up too. This type of clever work and exposure!Keep up the excellent works guys I've added you guys to blogroll.